This photo of Lance Cpl. 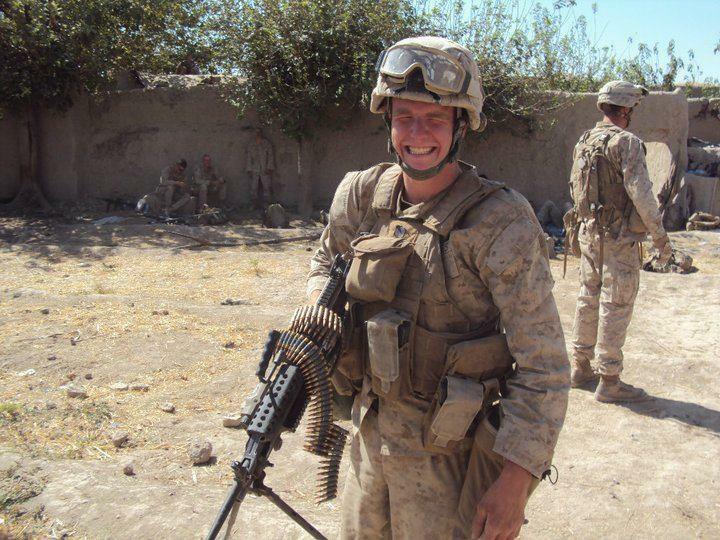 Blake Rodgers, taken as he was preparing to go out on patrol in the Helmand Province of Afghanistan, shows the pride and happiness he felt being a United States Marine. Less than four hours after this photo was taken on Sept. 1, 2010, Rodgers was killed in action. We each have defining moments in our life, those moments that shape our future in ways we perhaps cannot imagine. For Chris and Jane Rodgers, 9/11 was one of those times, but for much greater reason that the devastating attack wrought against our country – it was the catalyst behind their son, Blake, dedicating his future to the United States Marine Corps. Still just a boy, Blake spent the remainder of his childhood with that singular goal, a goal that was accomplished immediately upon his 2008 graduation from Spalding High School. Despite the dangers they knew their son would face, Chris and Jane said they always supported Blake’s decision to serve his country. They took great pride in the fact that their son had set such a noble goal, achieved it and went on to excel as a marksman. Jane said her son went to Afghanistan for one purpose – to defend this country. As a Marine, Blake also grew to love his band of brothers, and he developed a particularly close friendship with a young man named Chris Medina. Although they were in separate platoons, on Sept. 1, 2010, Medina was set to go out on patrol close to Blake’s camp in the Helmand Province. Because his platoon remained at its camp, Blake was able to take out his favorite weapon – the SAW, or Squad Automatic Weapon, which fires up to 1,000 rounds per minute – he was with one of his best friends and it was a beautiful day with blue skies overhead. “It was a great day for him,” Jane said. Less than four hours after he left camp, Lance Cpl. Christopher Blake Rodgers, only 20-years-old, was taken from his family that loved him more than life itself, killed by a single bullet fired in the midst of a horrific attack. As the two year anniversary of their son’s death approaches, Chris and Jane now reflect on the war he fought and the shifting sands of what once was the overwhelming support of the American people. Chris and Jane know their son will never be forgotten, and they are thankful for the rich legacy he left behind. Even so, people still understandably struggle to know what to say to his parents who have lost so much. Chris and Jane’s full support of Blake’s choice was the best gift they could ever give him–and is always the toughest gift for parents to give their sons and daughters when they know the ever present danger that exists for military combat warriors. I know how difficult it is for a Marine parent to present that support when you are so fearful of the possibilities for your loved one. I am the mom of a Special Forces RECON Marine, and thankful that he came home safely and unharmed after his 4 years of active duty service. My son made the commitment and did all of the hard work, but it was the hardest 4 years of my life & my husband’s, as parents. I am exceedingly proud of the commitment of all of our young warriors. May we always remember the fallen heroes and honor and support the warriors who came home after their commitments were fulfilled. We owe them a great deal!